The Conservation Commission's mission and purpose is to protect the natural environment of Beacon Falls by monitoring the development, conservation, supervision and regulations of natural resources, including water resources within its territorial limits. The commission keeps an index of all open space areas, publicly or privately owned, including open marshlands, swamps and other wetlands. Working in conjunction with the Land Use Committee, the conservation commission advocates for the proper use of these valuable resources. The Conservation Commission was represented by members and volunteers at Beacon Falls' annual Duck Race event on Saturday May 3rd. There might be no better time than a Saturday in spring to get out and enjoy the rural beauty of Beacon Falls. Whether it be hiking through the hills of Naugatuck State Forest, picnicking at Matthies Park, Fishing at Riverbend Park, boating on Toby’s Pond or exploring nature at Lantern Ridge. As the weather gets warmer, the natural world reawakens, plants grow and bloom, birds sing, animals become more active. The woes of a long winter are left far behind. What a perfect time to honor Mother Earth! Studies have shown that there are multiple health benefits associated with having parks, trails and open space within a community. Scientific evidence has suggested that when people have access to parks, they exercise more. In a study published by the CDC, the creation of enhanced access to places for physical activity led to an increase in the percentage of people exercising on three or more days per week and a Danish study, published in 2007, concluded that adults who could easily reach a green space had less stress and a lower body mass index (BMI). Also, contact with the natural world improves psychological health, reduces stress, boosts immunity and enhances productivity and is most likely essential for human development and long-term health and wellbeing. Parks and trails provide people with formal and informal gathering places to be physically active, socialize, relax, build community, and connect with the natural world. In recognition of Earth Day 2014, and on behalf of the Conservation Commission, I want thank The Town of Beacon Falls for recognizing and supporting environmental consciousness and the valuable assets of open space, and its parks and trails to promote community health. LANTERN RIDGE IS OPEN ! Check out some pictures from our Opening Day festivities ! BEACON FALLS — After 20 years in its possession, the town is ready to unveil a large parcel of open space for public use. Lantern Ridge Park, which is located on Skokorat Road, will be officially opened at 11 a.m. Oct.19 during a ribbon cutting ceremony. The 97-acre parcel was given to the town in 1990 when the Planning and Zoning Commission requested that a developer, looking to build houses on a larger parcel including Lantern Ridge, turn over the space. Planning and Zoning held onto the property until 2010 when the Beacon Falls Land Use Commission asked the Conservation Commission to do something with it. “What we needed to do was to learn what it contained and learn what it could be used for,” Conservation Commission Chairwoman Diane Betkoski said. Shortly after the Conservation Commission took over the property it commissioned an environmental review study which did a natural resource inventory of what was on the property, Betkoski said. After the study was complete the commission decided the property would best serve the town as an open space passive recreation park. “People can enjoy this park with hiking, horseback riding, and going out to explore nature,” Betkoski said. First Selectman Gerard Smith said he was pleased to see some of the open space being put to use as a passive recreation park. “The Conservation Commission has been working diligently to make it accessible to the people of Beacon Falls,” Smith said. Betkoski said the decision to allow the parcel of land to remain open space was done in part to keep up the feel of the town. 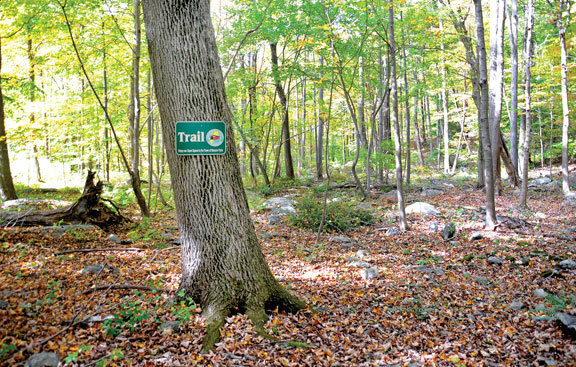 “This step in preserving open space in Beacon Falls is in line with its Plan of Conservation and Development and preserving the rural nature of the town,” Betkoski said. Betkoski said the parcel contains a steep ridge and some swamplands, which the original developer would not have been able to build upon. “It may not be useable for building, but it is rich in resources for individuals to learn and enjoy,” Betkoski said. At the moment, there is one trail that runs through the park but Betkoski hopes that, with the help of residents and Boy Scout troops, more trails can be created. While the town has beautiful areas, Betkoski said, Lantern Ridge gives residents somewhere new and different to explore without having to leave town. She encouraged residents to get out and explore the town’s newest park.